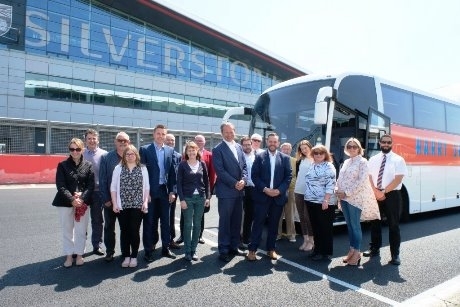 Groups can take advantage of Encore Tickets’ new Silverstone Experience which offers the chance to get an exclusive view of Silverstone Racetrack in Northamptonshire. The latest group offering from Encore will include visitors being able to take a lap of the famous F1 circuit by coach, head behind the scenes of the track to hidden areas, and have photographs on the winners’ rostrum, plus plenty more. The day-long experience starts with a welcome reception and introduction to the track from one of the Silverstone guides. Groups will then get an exclusive opportunity to look behind the scenes and tour a workshop, equipped with all the state of the art equipment used to keep a race car on track, followed by a trip to race control. Here you can view every part of the circuit on a wall of television screens and get a real sense of how a highly skilled team of people keep a watch on every aspect of a race, making second by second decisions on everything from safety issues to rule breaking. A highlight of the day will be a group visit to the podium for a picture opportunity on the same winners’ rostrum that is seen by over four million people all over the world on British F1 Grand Prix day in July. There will also be the chance to take a lap of the circuit in the coach. The group will then visit the British Racing Drivers Club headquarters (normally only open to racing driver members), followed by a shopping stop to buy souvenirs from the official Silverstone merchandise shop. The Silverstone Experience is open all year round, with one free ticket available for every 20 purchased. For further information visit www.encoretickets.co.uk.